Hi ladies, Welcome to Monday Mani Session !! Today I am sharing my first polka dot mani. I can't believe I haven't done any ! thanks to challenges that I finally did one. I planned a minnie mouse theme for this mani because I love this cute disney character so much. Whenever I think of polka dots minnie comes in my mind. I started with different base colors. 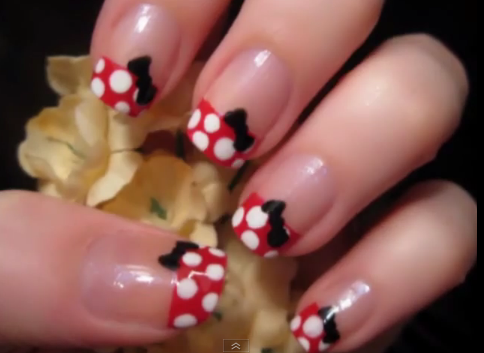 My fav is accent nail where I put rhinestones in bow shape just for a more girly feel and thumb with Minnie mouse face. Whats your favourite? If you are interested in learning step-by-step Minnie mouse tutorial, you can check my next post. I am planning for posting a tutorial every Tuesday ! So, stay tuned !